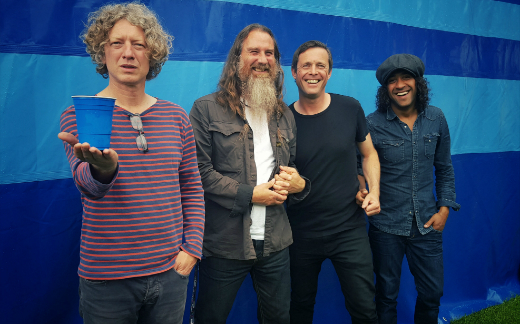 Earlier this year, pedigree Britpop legends Cast announced details of their brand new track ‘Paper Chains’, which was released through Warner ADA and is currently available to download. ‘Paper Chains’ is taken from the bands forthcoming album ‘Kicking Up The Dust’, due for release this spring. Both the new single and album were recorded at The Motor Museum in Liverpool and was produced by resident studio legend Alistair Groves. From playing bass in the legendary Northern band The La’s, John Power (guitar/vocals), Liam ‘Skin’ Tyson (lead guitar) and Keith O’Neill (drums) are joined by former La’s member Jay Lewis on bass. Originally formed in 1992, Cast reunited in 2012 with original producer John Leckie (Stone Roses, Radiohead, The Fall) to release a new album ‘Troubled Times’, their first studio album in over ten years. At the end of 2015 Cast celebrated the 20th anniversary of their classic album ‘All Change’, with two sold out shows at the historic Liverpool Philharmonic Hall where they played the record in it’s entirety accompanied by the Royal Liverpool Philharmonic Orchestra. New material, including tracks ‘Do That’, ‘Roar’ and ‘Baby Blue Eyes’ from their forthcoming album, are available to hear through the bands website and Soundcloud pages.